Fallout 4 Cars Coming to Forza 6 in Free DLC | Nerd Much? Turn 10 Studios has announced that the developer will release two Fallout 4 themed cars for critically acclaimed Forza 6. 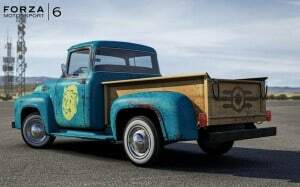 On November 4 (that’s today for those keeping score at home), players will receive a 1956 Ford F100 styled to look like it’s from Bethesda’s highly anticipated open world RPG (November 10th can’t get here soon enough). The truck is decked out with Vault-Tec’s iconic blue and yellow color scheme, featuring Vault Boy’s face on the doors. The truck also sports a significant amount of rust, as would be expected for a truck from a barren wasteland. Players will also receive a Chryslus Rocket 69 coupe, although images of the vehicle have yet to be released. “Everyone asks us if you can drive the cars in Fallout 4, and now we can say yes–in Forza, our favorite racing game,” said Todd Howard, game director at Bethesda Game Studios. Of course, driving was one of our wants on our Fallout 4 wishlist, so I guess this is a second best. It’s an interesting marketing tactic which is an attempt to align Fallout 4 with the Xbox One in the minds of consumers. You’re not fooling us, Microsoft. Of course, this free Fallout 4 DLC for Forza 6 on Xbox One only matters for just six more days, because when Fallout 4 is released, not a single gamer will be playing anything else (which is why we included it on our list of the top 30 best nerd gifts for this year).